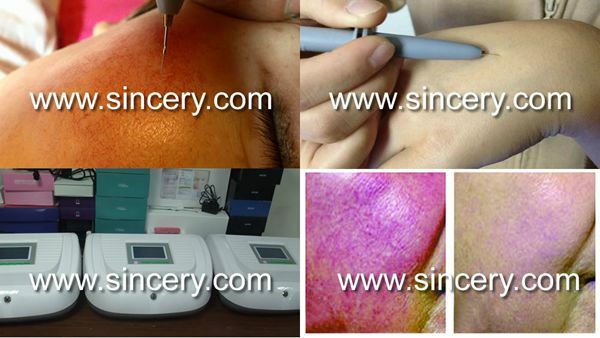 Custom and Cheap 2014 newest high frequency spider veins removal Supplier and Manufacturer.--Lumsail Industrial Inc. The BS-VA300 is based on the technology of high frequency cauterizing, which is used by medical professionals to eradicate telangiectasia. A hyfrecator has a stylus point that is laid not inserted, on the area of the skin having the spider vein being treated, and the high frequency current being applied is the hyfrecator is not selective and burns not only the vessel to be cauterized but also the surrounding tissue. This treatment leaves the skin with scabby areas that take up to six weeks to heal, frequently leaving spots of hyperpigmentation. The BS-VA300 uses direct current (DC) and high frequency (HF or RF) current to coagulate the capillary. The electric current interacts with the blood gases to coagulate and diminish the capillary. It is effective in diminishing telangiectasia, blood moles and other vascular blemishes.